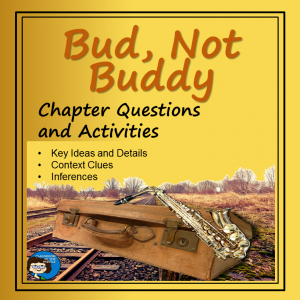 With it’s setting in the 1930’s and its connections to American history, the novel, Bud, Not Buddy, by Christoper Paul Curtis, is a great choice for a novel study in middle school or the upper elementary grades. 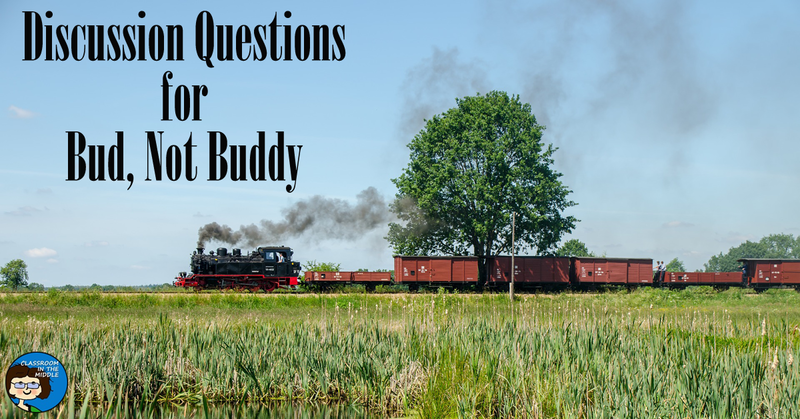 It brings up lots of interesting questions for discussion, some that could apply to kids of any time period and some history related. 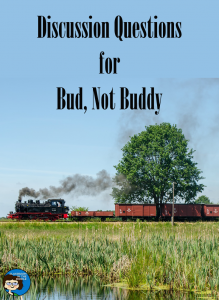 In case you haven’t read this one yet, Bud, Not Buddy is about a young boy, Bud Caldwell, who has had bad experiences in foster homes as well as in “the home” where he is sent back to between placements. At the beginning of the story, he runs away from a particularly mean foster family and sets out on his own. His idea is to search for the man he thinks just might be his father, the band leader Herman E. Calloway. 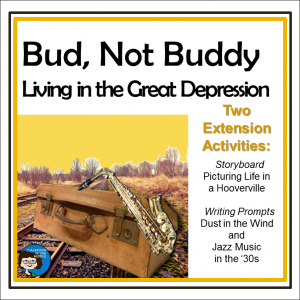 Like a large number of kids during the Great Depression, Bud ends up surviving on his own, like “dust in the wind” as another character described it. His adventures along the way make for an exciting story with a happy ending when he does finally find a family, even though it is not quite the one he expected. Why do you think life in foster homes was especially difficult during the 1930? How did you picture Bud’s everyday life in “the home”? In the Amos’s home? Bud chose to leave the foster system and set out on his own. Why do you think Bud made this choice, while other kids chose to stay? Bud’s independent spirit helped his survive a difficult life. 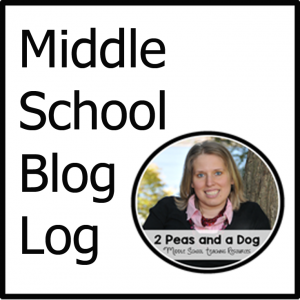 How might an independent spirit be helpful to a young person in different situations? Are there any things we can do to help kids who are still in a difficult family situation? What did you learn in history class about the Great Depression that might apply to this story? How did the Great Depression affect the everyday lives of parents and kids in America? Poverty may cause people to take desperate measures that they wouldn’t ordinarily try (such as “riding the rails”west in hopes of finding work). Do you think this still happens today? Explain. The 1920’s was a time for fun. People enjoyed going out, dancing, and listening to jazz music. The 1930’s was completely different, but people still enjoyed listening to jazz. Why do you think jazz was popular during this time? In the story, Jazz music provided a good living for Herman E. Calloway’s band. What do you think the life of a professional musician would be like? Each of Bud’s young friends is an interesting character, even though they are not main characters in the story. How would you describe each of these characters? 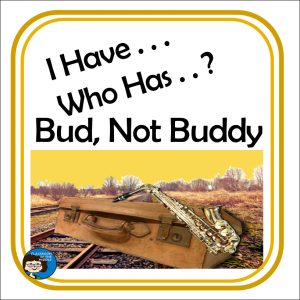 Herman E. Calloway, the band leader who turned out to be Bud’s grandfather, is a character who seems to change throughout the story, or at least what we know about him changes. How would you describe Mr. Calloway during most of the story? How would you describe him at the end? 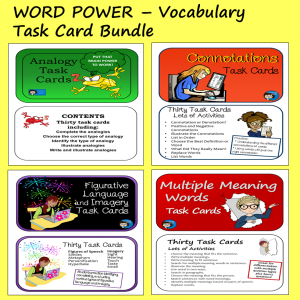 For more in-depth novel study resources for Bud, Not Buddy, check out this complete novel study with chapter questions and before and after reading activities, and this fun review game. This seems like a really interesting book that could start a lot of great discussions. 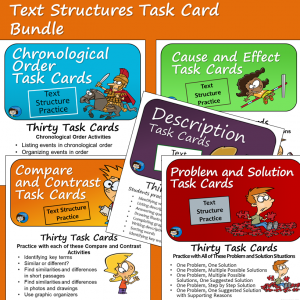 I like how you link it to so many different themes from that time period and get students thinking about the Great Depression. I thought it was an interesting read too, and I liked how it brought in both historical themes and modern ones. Great discussion questions. Thank you for sharing! I absolutely *love* “Bud, not Buddy”. It’s an excellent book because Bud’s perspective is shared with hilarity, even through themes that would normally be dark and heavy. It is one of my favorites by Christopher Paul Curtis, though I think I like “The Watsons Go To Birmingham” even more. You’ve created some excellent discussion points that would make for an interesting conversation, especially in light of current events, as many aspects are still relevant. Thank you so much for sharing. I haven’t read The Watsons yet, but it’s definitely on my list! Glad you liked the discussion questions.